By Keith Cowing on April 24, 2013 2:50 PM. "... In addition, only two instruments have been delivered for integration with ISIM and the other two instruments will be delivered at least 11 months late." 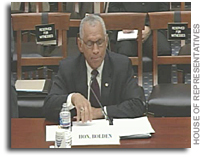 When Smith asked Bolden again about the two late Webb instrments, Bolden's reponse was: "That's news to me"
By Keith Cowing on April 18, 2013 3:04 PM. "In our solar system, only one planet is blessed with an ocean: Earth. Our home world is a rare, blue jewel compared to the deserts of Mercury, Venus and Mars. But what if our Sun had not one but two habitable ocean worlds? Astronomers have found such a planetary system orbiting the star Kepler-62." "Theoretical modeling of the super-Earth planets, Kepler-62e and Kepler-62f, suggests that both could be solid, either rocky--or rocky with frozen water." "The Kepler-62 system has five planets; 62b, 62c, 62d, 62e and 62f. The Kepler-69 system has two planets; 69b and 69c. Kepler-62e, 62f and 69c are the super-Earth-size planets." By Keith Cowing on April 16, 2013 9:35 PM. "We regret to announce that the 2013 STScI Spring Symposium, Habitable Worlds across Time and Space, has been cancelled. Space Telescope Science Institute operates as a NASA contractor. Our contractual obligations include support of workshops and seminars. In response to fiscal impacts resulting from the United States Government sequestration, NASA has temporarily suspended the contract authority and all funding that enables us to host conferences and seminars." By Keith Cowing on April 15, 2013 2:54 PM. "NASA will host a news briefing at 2 p.m. EDT, Thursday, April 18, to announce new discoveries from the agency's Kepler mission. The briefing will be held in the Syvertson Auditorium, Building N-201, at NASA's Ames Research Center in Moffett Field, Calif., and be broadcast live on NASA Television and on the agency's website." Keith's note: Not that this has any indiciation of what will be announced but Lisa Kaltenegger's Kepler-related publications all focus on small, habitable extrasolar planets and moons. (search). Thomas Barclay's papers also focus on Kepler and extrasolar planets. (search). These papers (by other authors) "The detectability of habitable exomoons with Kepler" and "Where to Find Habitable "Earths" in Circumbinary Systems" were submitted to astro-ph last week. By Keith Cowing on April 3, 2013 1:59 PM. "The findings hint at a new phenomenon but it is unknown whether the positron ratio comes from dark energy particles colliding with each other or from pulsating stars in our galaxy that produce antimatter." "These observations show the existence of new physical phenomena, whether from a particle physics or an astrophysical origin." This page is an archive of entries in the Astronomy category from April 2013. Astronomy: March 2013 is the previous archive. Astronomy: May 2013 is the next archive.